Ahhh, it's time to wrap up another year. Semicolon is hosting a "Wrap-up" edition of the Saturday Review of Books so if you'd like to see what other people are thinking about their past year of reading, or planning for the next, hop on over on Saturday the 1st to Semicolon Blog. As for me, I glanced through my list of titles read last year which I keep a running tab on over on the Master List. (If you ever want to know what I've read or how many books, I keep The Master List linked on my side bar.) This year I read 142 books, besting my 2009 reading self by 10 titles. Only this year I think I'm less excited by any particular book I read than I was in 2009. (The year of The Great Mysterious Benedict Society Addiction!) I think too many review copies bogged me down and got in the way of my reading books that I honestly would find more beneficial. Not to say I didn't enjoy myself! I DID! Thoroughly. I read a great deal for fun and entertainment purposes and I achieved that goal. But when I look back, I see very few things that I find very memorable. Which is kinda sad in some ways (but not in others!). That was a particularly awesome and meaningful series for me to pick up on in 2010. 1. In January I'll be hosting the Third Annual Lucy Maud Montgomery Reading Challenge. Click on the link to find out more about that! This challenge starts next week so get ready! 2. In July I will be hosting the Third Annual Chronicles of Narnia Reading Challenge. 3. I am also committed to Reading My Library again, noting admirable and notable picture books that my children and I have discovered at our local library. You can click on the button below to find out more about that! I'd kinda dropped the ball on that challenge for morning sickness reasons and lack-of-time sake but I kinda missed exploring new titles with my boys. Personally, I've already found my prior library explorations useful when my sons became interested in various topics. I know of book titles now that they will find particularly enjoyable! So the challenge is paying off for my family and it gives us a reading project to do together! Anyway, if you want to find out more about the library picture book reading challenge, follow the links! 4. In conjunction with the Reading My Library Challenge, I will also be participating in Hope is in the Word's weekly Read Aloud Thursday meme in which we share what we've been reading with our kids. I prefer to participate in this meme over at Reading My Library, since that is where a huge stack of our reading materials come from. But from time to time you might see a Read Aloud Thursday post pop up around here. 5. I'm joining Amy at A Faithful Journey by committing to read at least ONE Jane Austen book during 2011. (Surely I can do that, right?) Amy is hosting a Jane Austen Challenge which begins January 1, 2011 and lasts the entire year! You'll have plenty of time to participate, should you choose to do so. Sign up to participate and you'll be able to win a few prizes (none of which are shabby, I must say!) Learn more by visiting this post at A Faithful Journey. *Update: After thinking it over, I believe I will re-read Sense and Sensibility and watch the movie (Emma Thompson). Also, I'm kinda curious to re-read Emma. So, those will be my plans. That, my friends, is about all I'm going to say as to my purposes and plans for the next year. I'm looking forward to hearing what all of you are planning on reading in 2011 and then, of course, I'm looking forward to diving on in! The only Jane Austin I've read is Pride and Prejudice and I loved it. I need to read it again one of these days. Do you know which Austen book you'll read? I read four this year and enjoyed all of them (some more than others, of course). I'm with you--it's hard for me to write up these posts, too. I'm in on the Jane Austen challenge this year, too, I hope! Again, so glad you're playing again for RAT!! Wow that's quite a lot! I've already decided on the LMM challenge and think I might do the Narnia challenge -- I've wanted to read them again and it's fun to do with others. The Austen challenge is tempting, but I don't know -- I just finished reading through all her books, so since they're fairly recent reads, I'm not sure I'll want to read one again so soon with so many other books stacked up and waiting. But I have wanted to read P&P again because I was surprised that I really didn't like it -- so I'll have to think about that one. OK, no challenges for me. I've signed for the narnia Challenge twice, and then not done it. However, I just read The Narnia Code by Michael Ward yesterday, and I am again amazed at what subtle, intelligent, and gifted writer C.S. Lewis was. I need to re-read all of the Chronicles now just to see all the subtle symbols and motifs that Lewis included to give the books the atmosphere they had. Amazing! Ahhh sigh. The Narnia Code. It's on my wishlist! I hope you'll write your thoughts up on that one! I am hoping to read more in Swindoll's Great Lives Series. 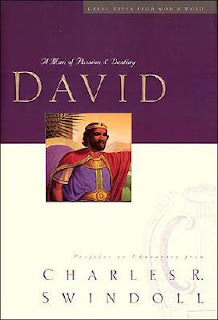 I really enjoyed David and am keeping my eyes out the other books. I think I am going to have to start joining in on the Read-A-Loud Thursday Meme and also look into doing the Read My Library Challenge. We spend a lot of time at the Library, so this is something that would be beneficial to me. The Narnia Challenge is also something I am definitly going to have to join in as well. I haven't re-read them, ever, I don't think. I attended a private middle/high school and they were actually part of our required reading one year. I loved reading them then and now that I am older, I know I will love revisiting them! Interesting. I feel similar about my reading year. There were good books, and a few that have stayed with me. But none that bowled me over the way a few of them did last year. I love the Emma Thompson Sense and Sensibility! Very impressed with the amount of reading you do. You've read about twice as many books as I did! ahh, sounds lovely! I look forward to another year of your posts and challenges and the wonderful giveaways! Thanks for the heads up on the Jane Austen challenge! I was planning on reading Pride & Prejudice this year anyways, so I think I'll join that one.